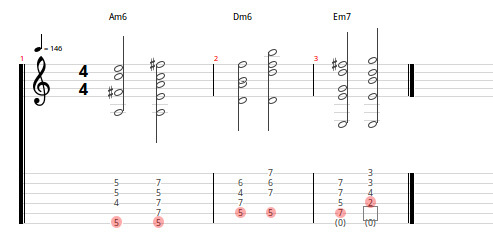 For a quick overview on how to play gypsy jazz, check out this excellent lesson by TheWall27! It covers all the basics. I will be focusing more directly on the harmonic and chords aspect. 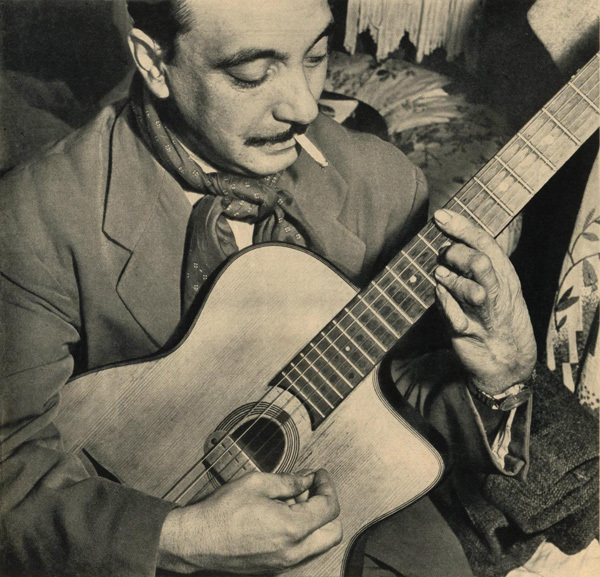 Django Reinhardt (1910-1953) was one of the most innovative guitarists of all time. At 18, he was injured in a fire, leaving his third and fourth fingers heavily burnt and paralyzed. Years later, he became an amazing player, using only two fingers for soloing (he reportedly managed to use his third and fourth digits for chords). A lot of the charm and feel of Gypsy jazz is made up by its harmonies. The chords create the strong warm drive and different feels of this music. 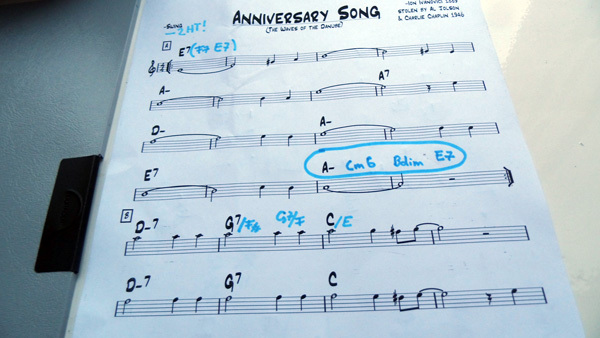 We can learn to play hot jazz ourselves (or take inspiration from it) by looking at the harmonies, chords and changes. 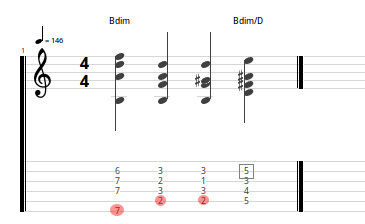 Specific intervals are added in basic major or minor triads to give them extra flavor. The most common are 6ths, 9ths or minor 7ths. Major 7ths and others (13ths, …) are played less common. These “flavor notes” can be complimentary to the melody or simply used to create a special tension or ring. The notes are mostly spread apart across the strings in high intervals. 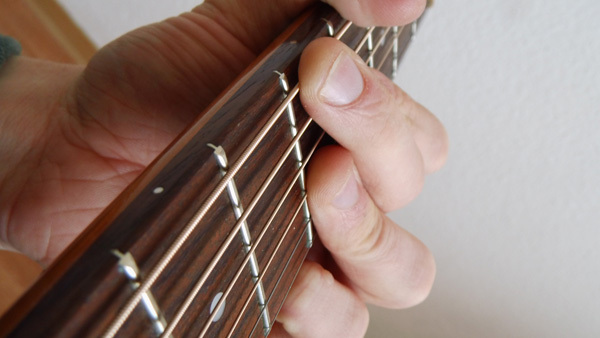 On guitar, most of the chords are movable shapes that you can slide up and down the neck. 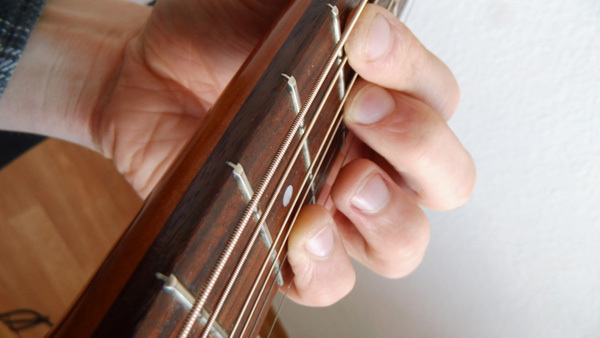 That makes it easy to play any chords if you shift the shape to the root you want. I marked all the root notes red. You know these. They “want” to be shifted into the tonic. Most tension. Used only rarely in turnarounds or as passing chords. Try to apply these ideas to any Gypsy jazz (or other!) tune that you like. There is hundreds of Gipsy jazz sheets available in Django Fakebooks like this. I hope you liked this lesson. Click here to shop BAJAAO.